We have been BIG fans of KLUTZ kits for awhile now. (My oldest daughter absolutely LOVES all of their craft kits!) So when I heard that KLUTZ was offering Maker Labs, I was thrilled. What I like best is that my kids are exploring, experimenting, asking questions, and problem-solving. The KLUTZ Maker Labs get them thinking about new ideas and topics. After working with the Maker Labs, they’re already checking books out from the library about circuitry projects. How cool is that?! The Maker Labs are designed for kids 8+ and would make a fantastic (and unique!!) gift. KLUTZ Maker Lab: Air Blast Cannon Build and Blast Your Own Cannon! o Ready, aim, blast! 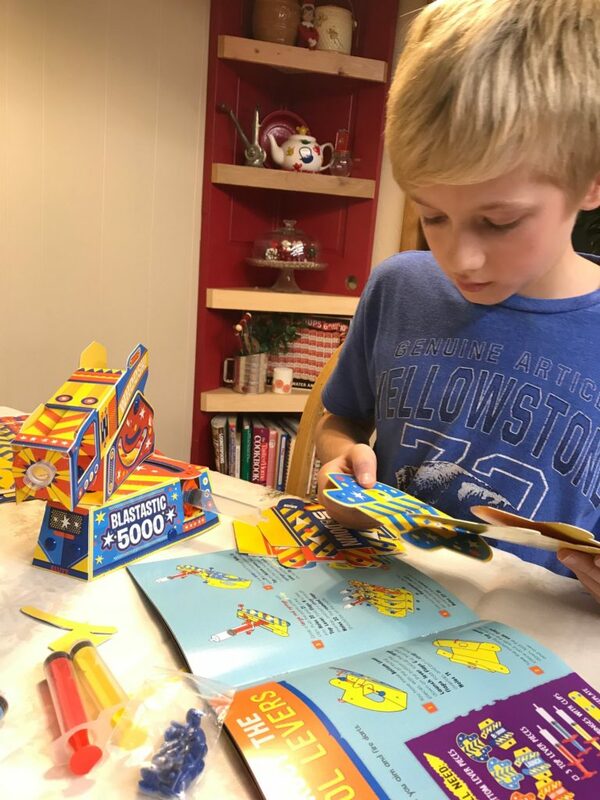 Using the fun and clear instruction book, construct a moveable, air-powered cannon and fire away at the included targets. Makers will explore the physics of projectiles, the mechanics of pneumatics, and how they work everyday machines – like bicycle pumps! My son was SO excited about this Maker Kit. From first glance, he knew this was a project he wanted to tackle. This kit took his love of building/construction and combined it with engineering in such a seamless and engaging way. The KLUTZ Maker Lab kits gave my kids such a sense of accomplishment. They weren’t just playing…they were making something…figuring out how things work…problem solving….working something through to completion. How many products for kids can do all that? This is STEM in action. Even now as I sit typing this, my son just came running into my room to show me something else he’d just figured out with the cannon. He’d figured out how to make the cannon swivel! I love that even after his initial time of figuring out how to get the cannon to work, he went back to continue to tinker, tweak, and learn. STEM play is the BEST! This Maker Lab is recommended for kids ages 8-12. My son, a 5th grader, was able to work though the Air Blast Cannon book independently. 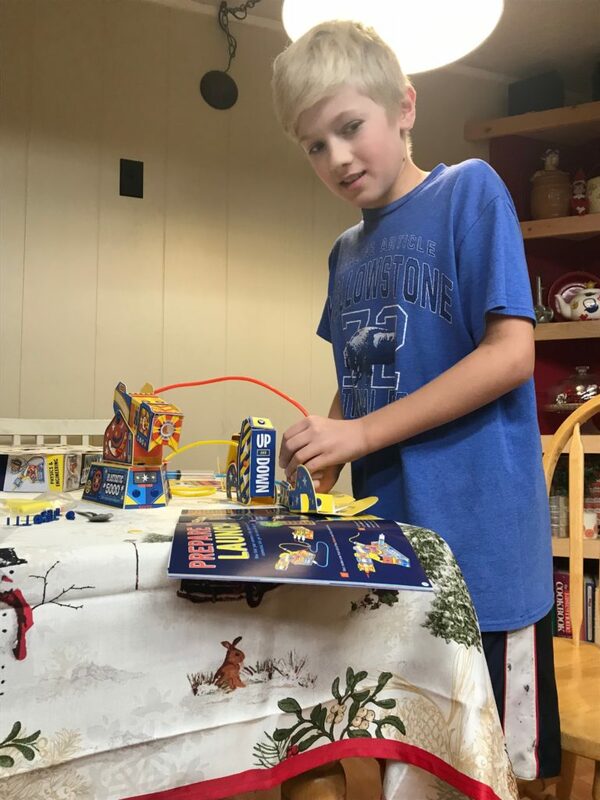 He said building the air blast cannon was a challenge, but a FUN challenge – and that he’d love to try another Maker Lab in the future. 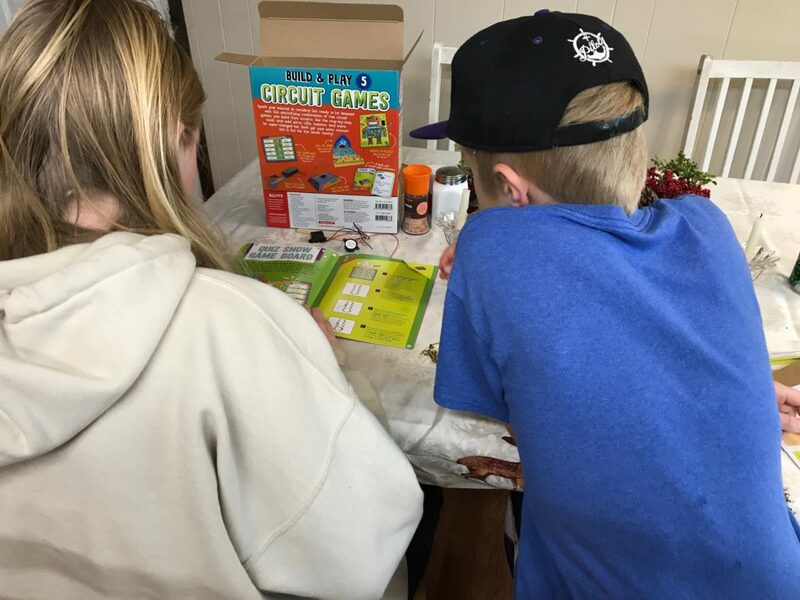 KLUTZ Maker Lab: Circuit Games Build & Play 5 Games! o Spark your interest in circuitry! Get ready to be amazed with this electrifying combination of five circuit games to build from scratch. Use actual electronic components to construct a DIY operation game, compete with friends in a Space Loop race, assemble a quiz show board, and more. 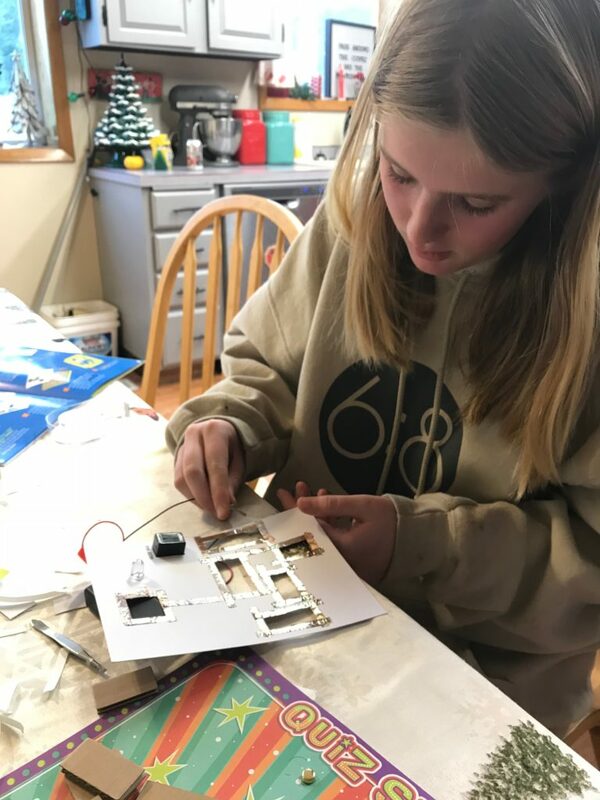 A step-by-step book of instructions teaches you how to be a maker by adding wires, LEDs, and buzzers for super-charged fun. My kids had a TON of fun with this one – and it was so neat to see them working together! My 7th and 5th grader dove into the kit soon after it was delivered, carefully observing all the included pieces and book -and decided to start with the Quiz Show Game Board. Within minutes they were working to connect wires and complete circuits. On their first try, they weren’t able to make the game board work, but it was important to me to not step in and do it for them. I love finding activities that challenge my kids – and push them to strengthen their problem-solving skills. These kits are right in the zone of proximal development. They are challenging and engaging without being stressful or overwhelming. While they didn’t get it quite right on their first try, they WANTED to try again. They truly wanted to figure out how to make everything work. 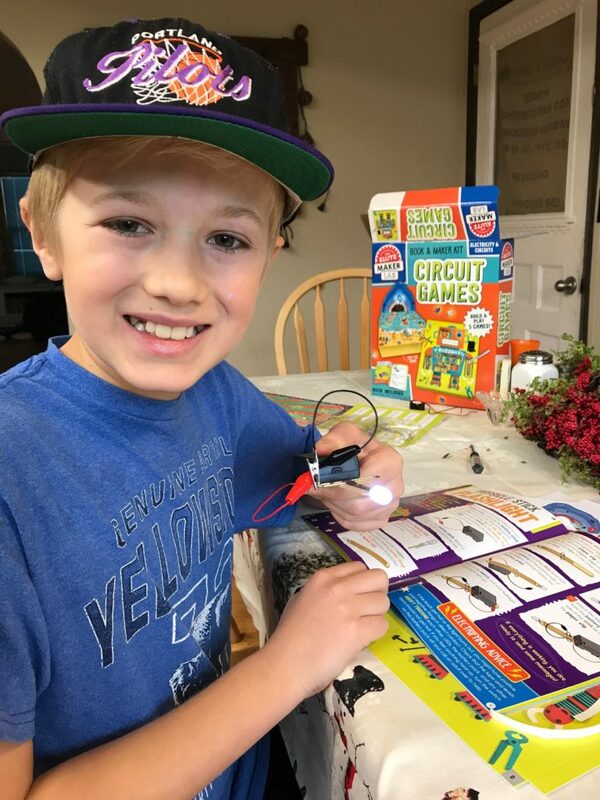 Soon after suggesting a quick break, I found my son back at the table, working to create a Popsicle Stick Flashlight- one of the projects include in the Circuit Games Maker Lab. He was determined to figure it out – and he made it work! He was SO proud of his working light. Seeing that her brother had created the flashlight, my daughter decided to give it another go. She soon had a working Buzzbot game! (Think Operation – with a robot!) The buzzer was a huge hit – and all the kids were eager to give the completed game a try. The Circuit Games kit was definitely a hit – and the kids can’t wait to complete the rest of the included activities. The kit is recommended for kids 8+. In my opinion, this kit is ideal for 3-5th graders.